For tropical beauty, look no further than Siam Tulip. 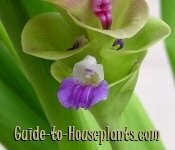 Its magnificent, upright flowers and handsome green foliage make a gorgeous house plant. Cupped petals and tall tulip-like leaves lend the common name, but it's also sometimes called Java Tulip and Hidden Ginger. Plant rhizomes in spring and you'll enjoy those big, dramatic blooms in summer. There's even a hidden surprise: In addition to the beautiful pink blooms, small violet flowers emerge from the bracts, adding to its charm. Native to Thailand, this tropical perennial is perfectly suited to indoor living in colder climates. It grows well in a pot. 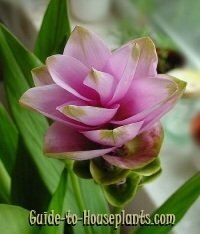 Plant Siam Tulip in a well-drained mix, and set in a bright location, out of direct sunlight. Shed some light. 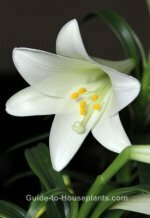 Put your flowering plant where it'll get plenty of light, but out of direct sun. If you don't have a spot near a window, fluorescent light works fine. Use 1 warm white tube and 1 cool white tube under a reflector. 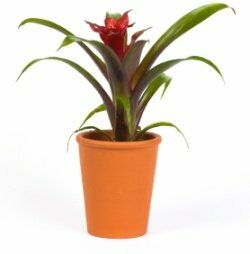 Place plant about 8 inches (20 cm) beneath the light for 14-16 hours a day. Without question, tropicals love humidity. If the relative humidity drops below 50%, use a pebble tray or room humidifier to increase the moisture in the air. Grouping plants also helps to maintain the humidity around them. Give it a winter rest. 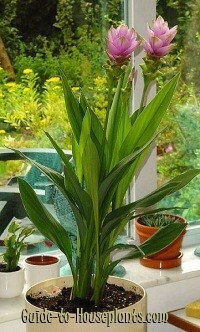 Curcuma alismatifolia will go dormant. Beginning in November, decrease watering to allow the leaves to die back naturally. Stop fertilizing during this time. Let the plant rest for 3 months. In early spring, repot the rhizomes in fresh potting mix and resume normal care. A member of the Zingiberaceae (Ginger) family, this ornamental belongs to a diverse group, including edible plants. Siam Tulip is purely decorative. Once a rare tropical plant, Curcuma alismatifolia is gaining in popularity and is now available from online nurseries in spring and summer. You may find it at your local garden center, if you live in a tropical region. Light: Bright indirect light. These tropical flowers need plenty of bright light to bloom, but keep them out of direct sunlight, which can scorch their leaves. Water: Keep the soil lightly moist during the growing season. Use a pot with a drainage hole to prevent soggy soil, which will cause the rhizomes to rot. Humidity: Moderate to high, preferably 50-70% relative humidity. Temperature: Keep at 65-70°F/18-21°C year-round. Fertilizer: Feed monthly with a 10-20-10 liquid fertilizer diluted by half while plant is growing and flowering. Propagation: Divide rhizomes in spring.